U.S. spokeswoman: Ahmadinejad "spouting paranoid theories and repulsive slurs against Israel." But the Iranian president generally steered clear of the more toxic remarks about Israel which have sparked mass walkouts at his previous seven appearances before the UN summit. The Iranian government faces mounting international pressure over its nuclear drive, which western powers say hides a bid to develop a nuclear bomb. President Barack Obama told the UN assembly on Tuesday that the United States will "do what we must" to prevent Iran from getting a nuclear weapon. Foreign ministers from the United States, Russia, China, Britain, France and Germany will meet in New York on Thursday to discuss the increasingly tense nuclear showdown. Ahmadinejad's last stay in New York as president has been marked by new condemnation of Israel which he refused to mention by name, calling them the "Zionists" or a "fake regime". The United States boycotted the UN speech because of his attacks. "Over the past couple of days, we've seen Mr. Ahmadinejad once again use his trip to the UN not to address the legitimate aspirations of the Iranian people but to instead spout paranoid theories and repulsive slurs against Israel," said Erin Pelton, spokeswoman of the US mission to the United Nations. Israeli diplomats also stayed away, partly because Jews were marking Yom Kippur, the holiest Jewish day of the year. Outside the UN headquarters, demonstrators protesting at Ahmadinejad's presence set up a hangman's gallows to symbolize Iran's widespread use of executions. Diplomats from Britain, France and Germany sat through Ahmadinejad's address, but found nothing in his lecture-like theological comments to justify a repeat of the walkouts of previous years. 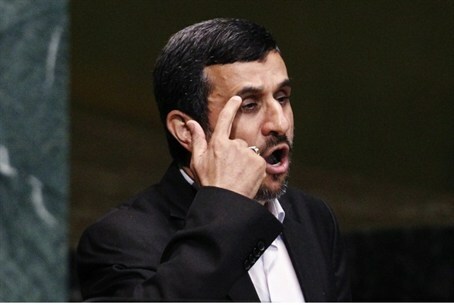 In past speeches, Ahmadinejad has said the US government may have had a role in the September 11, 2001 attacks on New York and called for the eradication of Israel. This time he gave a long lecture about the need for a fairer world and lashed out at the Western nations for the global economic crisis. "The current abysmal situation of the world and the bitter incidents of history are due mainly to the wrong management of the world, and the self-proclaimed centers of power who have entrusted themselves to the devil," he said. "Creation of worthless paper assets by using influence and control over the world's economic centers constitutes the greatest abuse of history, and is considered a major contributor to global economic crisis," he said. Much of the speech was devoted to religion. Ahmadinejad hailed the imminent arrival of an "ultimate savior", Imam Al-Mahdi, "a man who will come in the company of Jesus Christ and the righteous." As a Shiite Muslim, Ahmadinejad reveres Islam's twelfth imam, Muhammad Al-Mahdi, who disappeared from the earth in the tenth century and is said to be due to return, accompanied by Jesus, to save mankind. The date of his return is not known, but Ahmadinejad indicated that he felt the arrival was imminent, telling delegates: "Now we can sense the sweet scent and the soulful breeze of the spring, a spring that has just begun." Ahmadinejad's speech was applauded and he acknowledged the acclaim with a wave before leaving the UN stage for the last time.